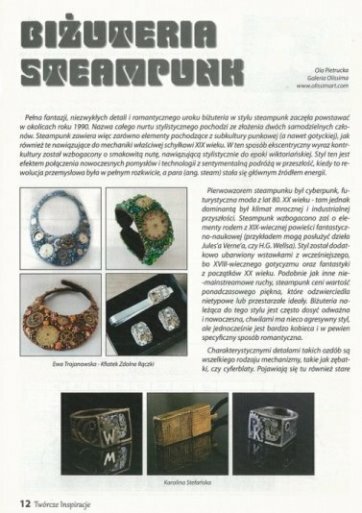 * In May 2014, the magazine "Creative Inspirations" was published the article "Steampunk Jewelry" written by Ola Pietrucka - owner of Olissima Gallery. 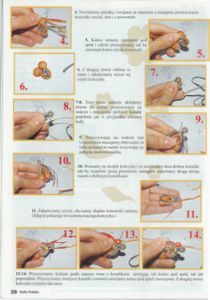 In addition, in the same issue was published tutorial "Bracelet steampunk" created by Kfiatek Gifted Hands - cooperating with Olissima Gallery. 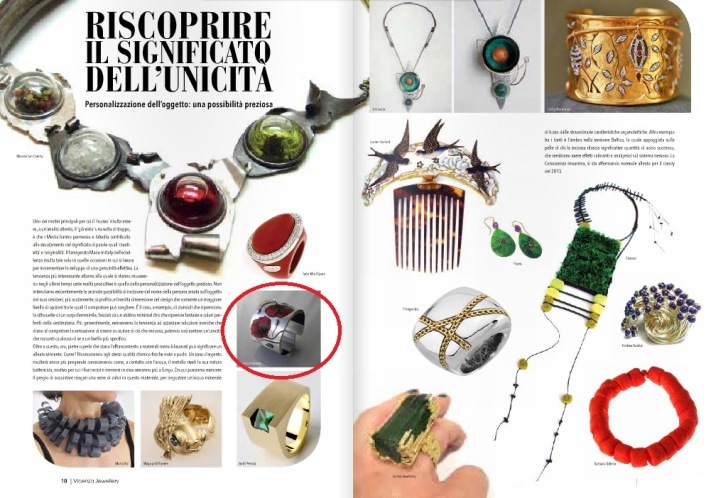 * In April 2014, the Italian Vicenza Jewellery Magazine has been presented, jewelry made by Jolanta Bromke from Olissima Gallery. Presented in the stock jewelery by this artist can only be purchased at the Gallery Olissima. * Jewelry by Beata Sas Narkiewicz cooperating with Gallery Olissima became the pride of this year's banner XV International Fair of Amber Ambermart 2014. Ring presented the banner can be viewed and purchased HERE. 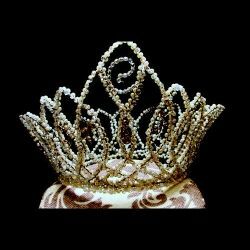 * Show of artistic jewelery for First Ladies. We are pleased to inform you that the Office of the President of Poland invited the Gallery Olissima to organize a show of artistic jewelery for First Ladies : Evelin Ilves - wife of the President of Estonia and Anna Komorowska - wife of the Polish President . Show was held on 03.18.2014 at the headquarters of cooperating Wytwornia Antidotum at Street Willowa 8/10 in Warsaw. Lecturer from Wytwornia Antidotum presented selected techniques of making jewellery : Ramigiusz Grodzicki - deposition zirconia on wedding ring , Robert Szklarski - historical techniques repus , foldforming and engraving. In addition, organized an exhibition of art jewelery where presented were works of artists collaborating with Olissima Gallery and Wytwórnia Antidotum : Piotr Malysz , Elisabetta Capello , Kacper Schiffers , Alina Tyro - Niezgoda , Bartosz Ciba , Marcin Mlynarczyk , Sława Tchórzewska , Karolina Gletkier, Aleksandra Surmak , Andrzej Kupniewski , Marcin Tyminski . 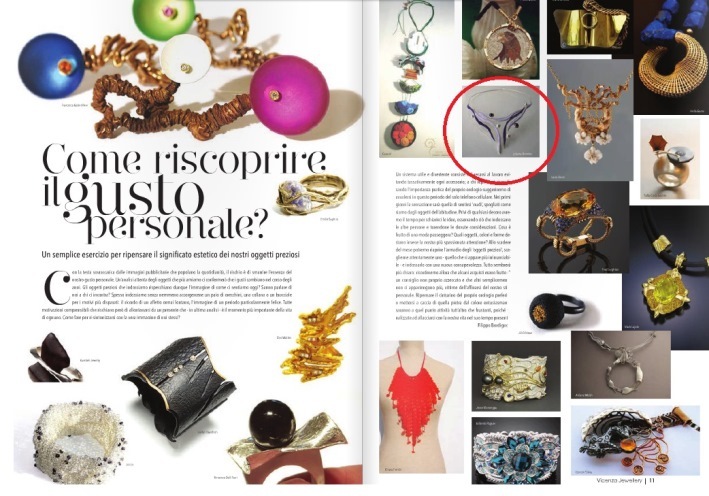 * In March 2014, in the magazine Grazia was presented jewelery made by cooperating with Olissima Gallery creator of CIBA. We invite you to his gallery. * In the latest issue of the monthly Wedding is presented jewelry from Olissima Gallery. 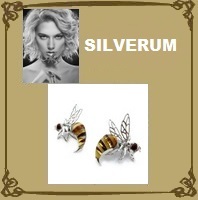 The author of this jewelry is to Bartek Ciba. * In 2013 Aga Sobel SopelkaArt from Olissima Gallery won first prize in the challenge, organized by a group of Metal Clay Europe. Topics challenges were: "Out of this World" and "Under the Sea". The prize was a set of the Rings "Underwater World". 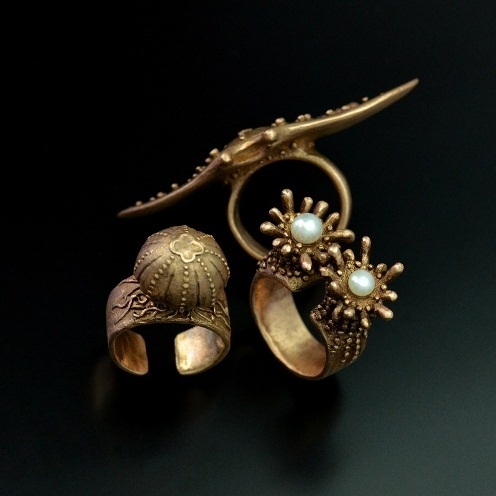 Rings made entirely of brass, inspired by unusual creatures of the deep sea: mantra, anemones and jellyfish. One of the rings decorated with freshwater pearls. Welcome to her gallery. * In 2013, Karolina Stefańska from Olissima Gallery won the second prize in the challenge, organized by a group of Metal Clay Europe. Topics challenges were: "Out of this World" and "Under the Sea". 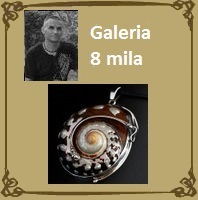 He received the award necklace "Gorgonia". 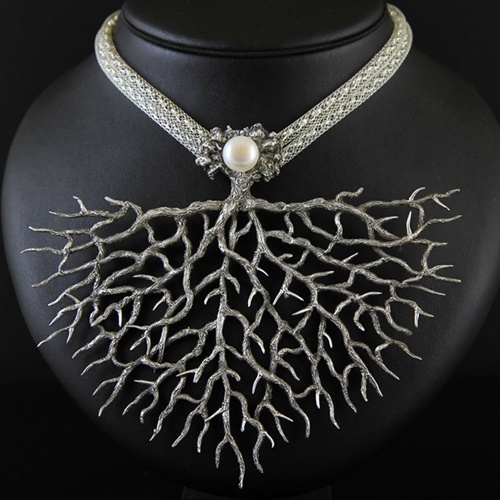 Necklace with hand-carved branches underwater gorgonians, called sea fan, made entirely by hand with silver, decorated with large white pearl and silver hung on the network. Welcome to her gallery where you can buy the necklace. 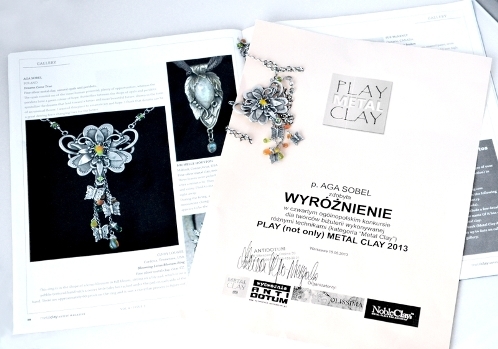 * In 2013, the Aga Sobel SopelkaArt from Olissima Gallery won the award in the IV National Contest for Jewelry Artists: PLAY (not only) METAL CLAY 2013. Was awarded pendant "Dreams". 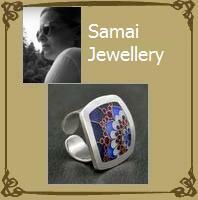 Work is made entirely of silver, decorated with natural stones: opal and peridots. Welcome to her gallery. * In September 2012 the Twoj Styl was shown jewelry from Olissima Gallery. Presented was necklase made braid embroidery technique (soutache) by Sylwia Żak. 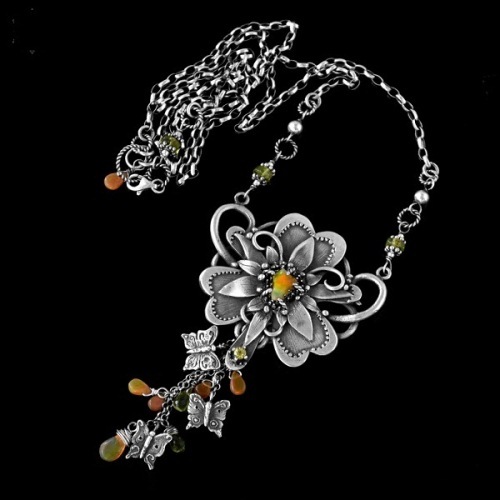 * In July 2012, in the anniversary, the hundredth issue of the magazine "Show" was presented a necklace made by Anna Nycz from Olissima Gallery. 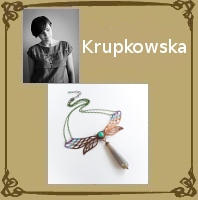 * In July 2012, the portal ofeminin.pl presented jewelry by Anna Lipowska and Kleo from Olissima Gallery. * In January 2012 in the Purpose.pl - culture, science, entrepreneurship, was published an interview of week with Ola Pietrucka from the Olissima Gallery. 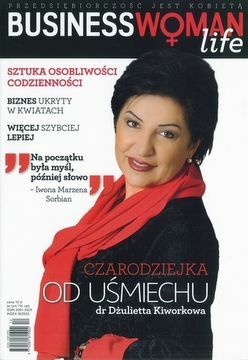 * In November 2011 in the modamagazyn.pl polish fashion magazine was presented the jewelery of the Gallery Olissima. 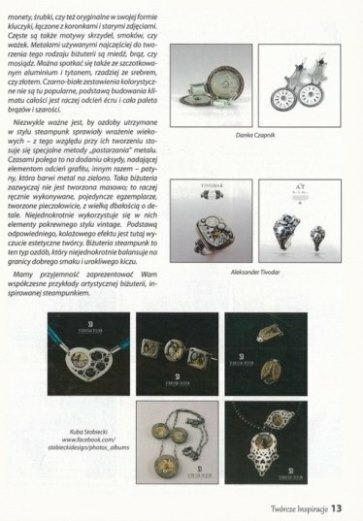 * In December 2011 in the portal menstream.pl in the article "The best ideas for gifts for women," was presented jewelry made by Marta Grzywna from the Olissima Gallery. 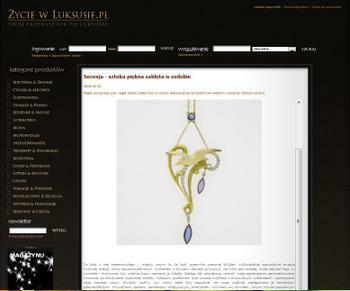 * In December 2011, in the portal amber.com.pl was published interview with Aleksandra Pietrucka from the Olissima Gallery. 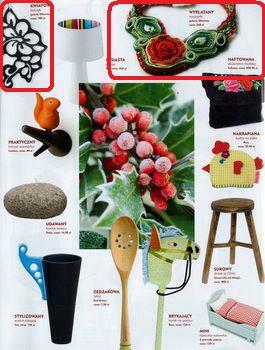 * In November 2011 in Bobyy magazine (bobyy.pl) belonging to the Burda group was published an article about Olissima Gallery. 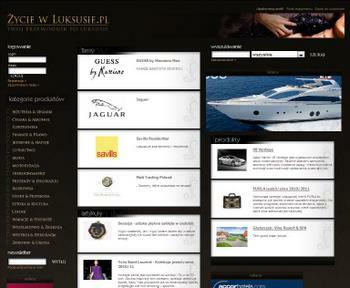 * In September 2011, in the portal we-dwoje.pl was published gallery of works by artists from the Olissima Gallery. 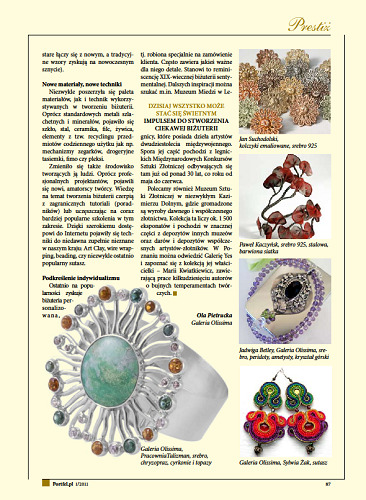 * In July 2011, in the Ex Magazyn (eksmagazyn.pl) was published the article "The power of nature in jewelry So Young Park," by written Ola Pietrucka from the Olissima Gallery. 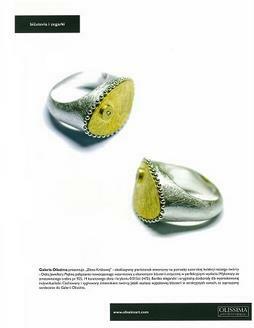 * In January 2011 the Portfel.pl Magazine was published article "The antidote to gray everyday life - jewelry art" written by Ola Pietrucka from the Olissima Gallery. 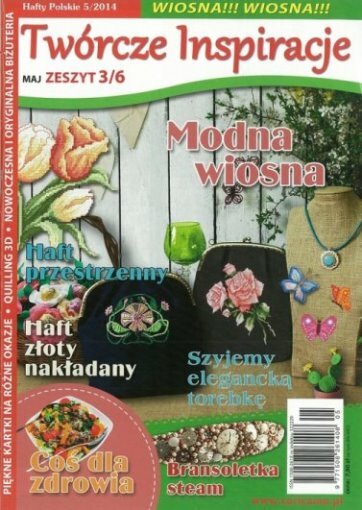 * In June 2011, in the Ex Magazyn (eksmagazyn.pl) was published the article "Soutache in the Polish version" written by Ola Pietrucka from the Olissima Gallery. 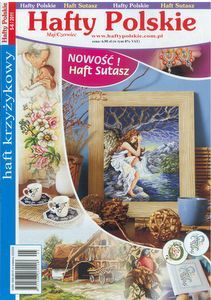 * In April 2011 the magazine "Polish Embroidery" was presented Olissima Gallery's tutorial, which learned work in braid technique (soutache). The author of this tutorial, Galeria KiWi is cooperating with Olissima Gallery. * Gallery Olissima was media patron an exhibition of photographs by Agnieszka Lucyna Jaźwińska and Maia Zembrzuska - graduates of the Faculty of Media Arts Academy in Warsaw. Opening and Exhibition held in May 2011 in the Schody Gallery Nowy Świat 39 Street in Warsaw. 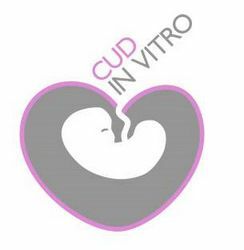 * At the order of the Foundation Cud In Vitro, Olissima Gallery executed collection of commemorative bracelets which, under the promotional activities of the Foundation will be awarded for public persons from politics, show business etc. 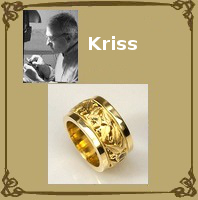 Jewelry was made by Martcin Mlynarczyk from Olissima Gallery. 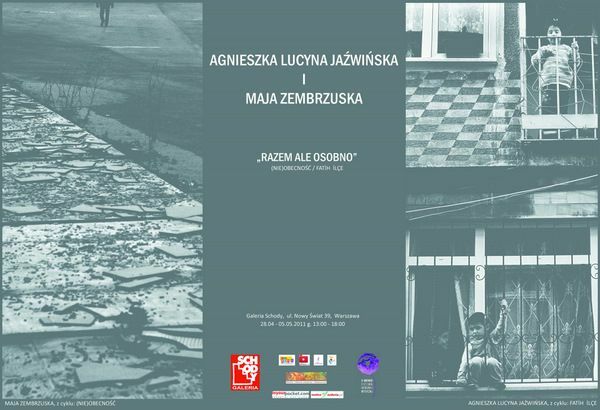 * Gallery Olissima media patron of the exhibition of artistic jewelery and clothes of Sława Tchorzewska and Ewa Godun. 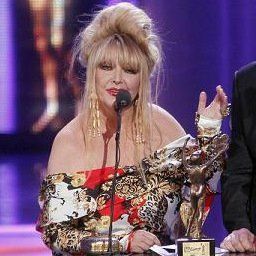 Shows of works was in March 2011 in the Baltic Philharmonic in Gdansk and the Contemporary Theatre in Warsaw. 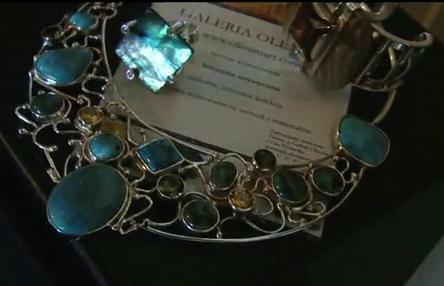 * In March 2011 the Show Magazine was shown jewelry from Olissima Gallery. Presented was earrings made braid embroidery technique (soutache) by LiAnna. 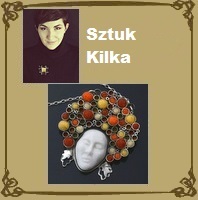 * Gallery Olissima made jewelry ​​to order , in which the famous polish singer Mary Mary performed at the gala Telekamery. Beautiful jewelry, inspired by Byzantine art, was made by Pracownia Delicje. * In January 2011 in the Claudia Magazine presents information about the Olissima Gallery. 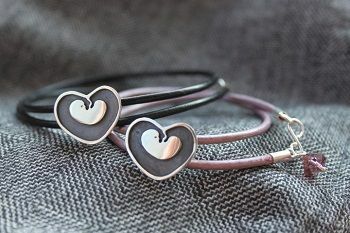 In the "theme of month" presented the Gallery as one of the interesting places that sell jewelry, and worth a visit on the Internet. 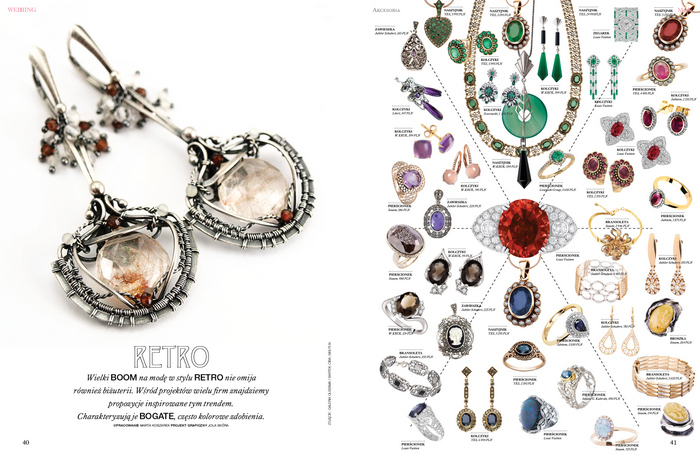 * In December 2011 in the magazine "Businesswoman of Life" (businesswomanlife.pl) was presented jewelry from our Gallery: earrings, "Bells" earrings "cutouts" and earrings "Hypnosisi" made by Marta Rudnicka, necklace and earrings from the collection "Erendira" - made by the Department Amareno and necklace "Fatima" - made by Jagienkaa. 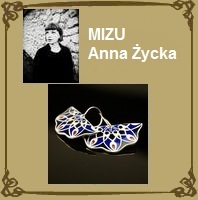 * In December 2010 in the magazine "Pani" was presented jewelry from OlissimaGallery: necklace "Folk" made by Hannah Studio and earrings "Floris" made by Michael Wyszomirski. 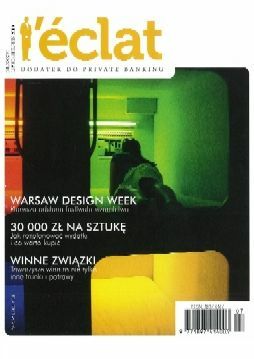 * In the magazine "Living in luxury - Your guide to luxury" (zyciewluksusie.pl) was published the article "Secession - the art of beauty in ornament Enchanted" written by Ola Pietrucka the Gallery Olissima. * In the magazine "L'Eclat" (published by Noble Concierge / Noble Bank) was published the article "Antique Jewelry Online auction" written by Ola Pietrucka. * Jewelry from the Gallery Olissima was presented in a photo session o2trend realized under the leadership of Joanna Misztela. 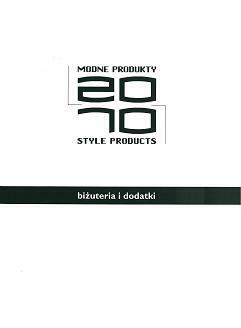 * Olissima Gallery has been selected for presentation in the "Fashion Products 2010"
* Olissima Gallery was one of the patrons media photography exhibition "12", where was presented the works of graduates of the Faculty of Media Arts Academy in Warsaw. * In the Banana Blox - one of the oldest and most influential fashion blogs in Poland (www.banana.blox.pl) was presented an article on the Gallery Olissima. 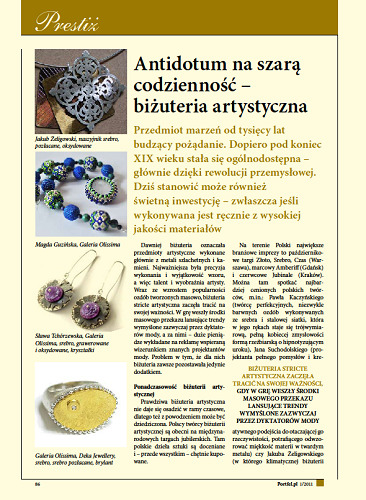 * An article about Olissima Gallery in the Repka.pl- one wth the oldest and one of the most popular portals for woman in Poland. * Contest Olissima Gallery and television Hallmark Channel.